How well does your website convert patients? Websites are necessary to compete in today’s dental market, but you’ll want to make sure the design is attractive, well laid out, and that it functions properly to convert new patients. If you are in the process of creating a new website design, think about what feelings you want to invoke about you and your practice, and what types of patients you want to convert. At Infinity Dental Web our focus is to really get to know the client, their practice, and understand what their marketing objectives are prior to starting any design project. We also know about patients – we know what they want and how they feel about the websites they see because we are constantly listening to their comments about them. For general, bread-and-butter dentistry practices, a simple, clean-looking design works well. For those marketing cosmetic dentistry, however, we recommend high end designs that convey a classy image. First, we start with the home page design. It’s critical that this page engage visitors within the first few seconds upon entering the website. Internet visitors often look at a number of sites before deciding on a dentist, and their first impression is key. But all visitors aren’t the same. Some are looking for cosmetic dentistry. Others may be looking for affordable dentistry. And, there are many people who suffer from dental anxiety. These people feel ashamed of their teeth and their dental fear and usually require a great deal of dental work. They are looking for a feeling of warmth and kindness. Since each type of patient is looking for something different, what elements should the design include? Here is an example of a website that has the elements listed. To view more websites in our portfolio, just click here. Slideshows work well for a bread-and-butter dental practice too. Actual photos of your patients are preferred, but aren’t always necessary. The right types of stock photos can also work well. Be sure to display a photo of the doctor. For a cosmetic dentist we normally suggest a nice shirt and tie, but a nice button up shirt may show the dentist as more relaxed and may help put people with dental fear at ease. Simple, clear navigation is very important. Avoid using too many call to action items, which should be limited to: the main navigation bar; Request An Appointment button; patient reviews and social media buttons or links. 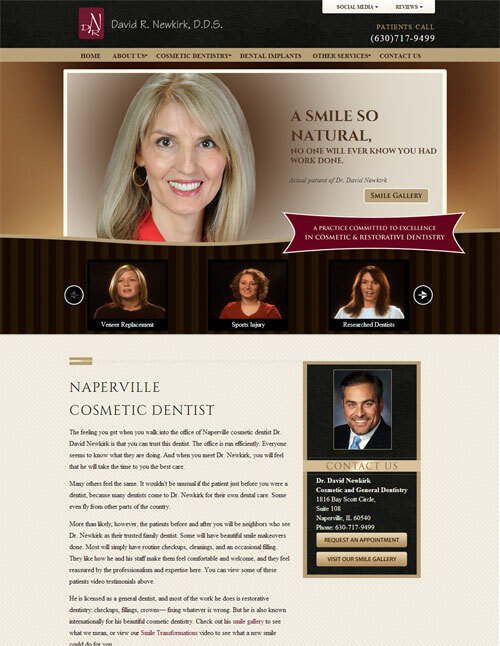 Further, if the website is for a cosmetic dentist, a Smile Gallery button should be prominently displayed. Patient testimonials work well in the text, however, patient video testimonials are much more powerful. Let’s not forget colors. Carefully selected colors are extremely important. It’s best to choose colors that are calming, yet rich. Loud or bright colors work for some practices, but not all. Finally there is the layout. Designs work best when there is a lot of open space. Be sure to offer a lot of white space, so people will feel relaxed and know exactly where to find what they are looking for while on the website. In my next post I’ll discuss how to showcase smile galleries for cosmetic dentists and the importance of having an office tour of your practice and more on the website. Visit us to see our website packages here. Chris is the Vice President of Marketing at Infinity Dental Web where she supervises website design and client relations.